One of the things I hate about playing with some people is that they don't know how to play rearguard. The rearguard should be facing away from the team in the direction that they just came from. This is because you are covering their rears! The idea is to be alert to someone coming up behind you from an area that may not have been cleared yet. You should have one of your keys mapped to walking backwards and use it. You need to walk backwards, turn corners backwards, go up and down stairs backwards, everything backwards. You should enable your partner's viewscreen so you can see what is happening with the rest of the element and then just learn to walk backwards and stick to the walls, using the eyes of the man ahead of you (or in this case, behind you) to show you what is coming up.. In the screenshot at right, you can see [DoubleTap] working his way down the hallway with [naiboo] and [icarus_uk]. 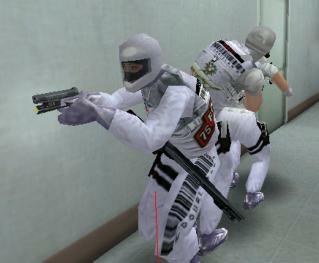 [DoubleTap] is walking backwards and has his weapon at the ready to engage any threats that come from that direction. It is very important for the rearguard to close doors behind the element. This gives you an extra second or two to be alerted to the presence of a threat. It also lets the "fatal funnel" work for you! When the suspects have to search for you after entering a room, it takes them longer to take you out, giving you a real chance for survival. You will almost certainly not be able to bang or gas any threat coming from the rear, so don't bother trying or you'll be toast. In real life, officers touch each other a lot. When signalling that you are ready (especially for those areas where you can't afford to use throat or lip mics), you squeeze the leg of the guy in front of you. In the case of the rearguard, his partner may be facing forward, but will almost literally drag him through the place by grabbing his belt to let him know which way to move and when they are moving. He will then use tap and squeeze techniques to let him know to hold, cover etc.